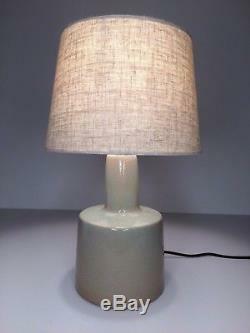 Description: A vintage Mid Century ceramic table lamp (Model #105) designed by Jane & Gordon Martz of Marshall Studios. 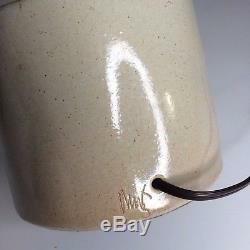 Subtle glaze with slightly more red fleck near base that transitions to slightly more green fleck near neck. 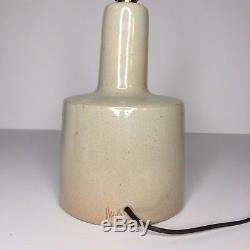 A very handsome Mid Century lamp the comes complete with newer shade. 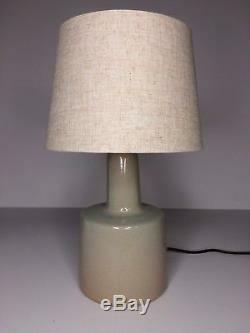 9.5" H x 6.25" W (ceramic base); 16.5" H to top of shade; Shade built to factory specs (10" bottom diam, 8" top diam, 7" slant). 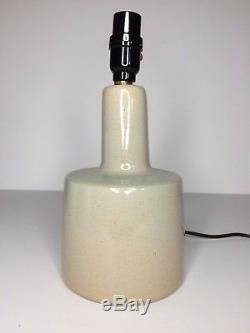 Condition: Ceramic base is in excellent vintage condition with no chips or cracks. In very good working condition with updated wiring. Newer shade built to Marshall Studios specifications. MY FOCUS IS ON MODERN AND CONTEMPORARY ART AND DESIGN. PLEASE CHECK OUT MY OTHER LISTINGS. In some cases, particularly if we have just auctioned a large number of pieces, it might take us 2-3 days max. 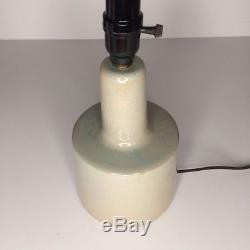 The item "Vintage Complete Martz Marshall Studios Red Green Fleck Ceramic Table Lamp" is in sale since Thursday, January 25, 2018.